According to the United States Geological Survey (USGS) provisional data — updated with the recent official figures for China, Russia and Peru — estimated global gold production rose to 2,700 tonnes in 2012, or 1.4% growth compared to 2011 (2,662 tonnes). The top 10 gold producing countries mined out about 1,807 tonnes of the precious metal which is 2.4% more than in 2011 (1,765 tonnes). Among them, four countries — China, Russia, Canada, Ghana — increased their gold output and six — Australia, USA, South Africa, Peru, Indonesia, Uzbekistan — fell in production (Figure 1). Taking into account the quite borderline provisional data for Indonesia and Uzbekistan with a difference of only one tonne of produced gold in 2011/2012, these countries eventually could be either gainers or losers later, depending on final gold output figures. Figure 1. 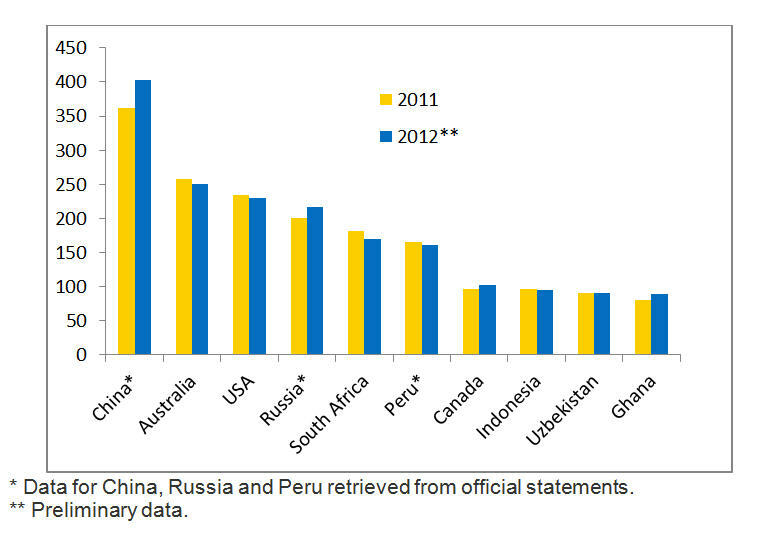 Gold production by ten leading countries in 2011/2012, tonnes (USGS data, except China, Russia and Peru). China is the undisputed leader for a sixth consecutive year with 403 tonnes of gold produced in 2012 (+11.3%) followed by Australia (250 tonnes, -3.1%) and the US (230 tonnes, -1.7%). Russia increased its gold output by 8.5%, to 217 tonnes (include primary production and by-product), and holds fourth place. Ranked fifth, South Africa significantly decreased its gold production in 2012 (-6.1%). Ghana, which shares leadership with China in terms of gold production growth in 2012 (+11.3% compared to 2011), rounds out the list of top 10 producers. 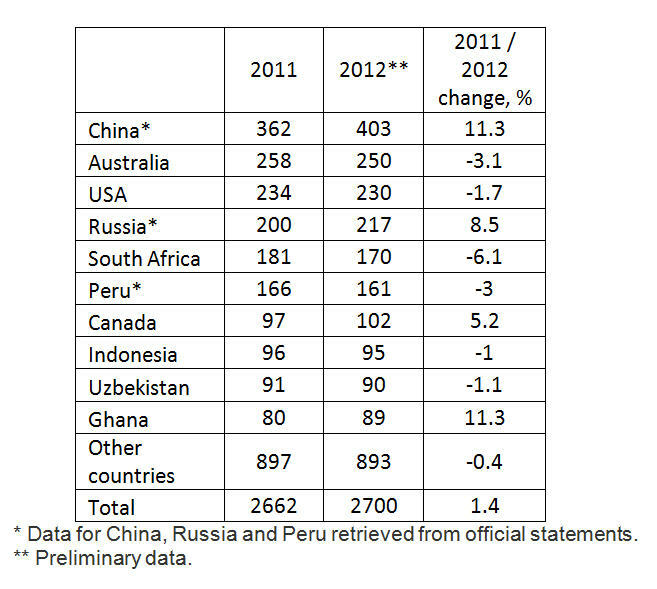 Full data on world gold production in 2011/2012 is presented in the following table. Table 1. World gold production in 2011/2012, by top producing countries, tonnes of gold (USGS report, except data for China, Russia and Peru). Unlike previous years, medium and small gold-producing countries decreased their gold output in 2012 by 0.4%, from 897 tonnes of gold in 2011 to 893 tonnes in 2012.